I consider myself a big Neil Gaiman fan. I've watched TV episodes he's written. I've seen him speak in person twice. I follow his blog. I've read short stories by him. But this is only the third one of his books I've read. That's really a shame, because Neil Gaiman is an author who deserves to be read completely. The Ocean at the End of the Lane is a delightfully creepy, dark, scary, and even a tiny bit heart-warming tale. One of the things I like best about Neil Gaiman is that he writes fairy tales. By that, I don't mean that his stories have fantastical elements, although they certainly do, but that the voice, the narration feels like a fairy tale. It has a beautiful, timeless quality that makes me want to keep reading, no matter what the plot is. The story is told through the eyes of a seven year old boy. Gaiman does a fabulous job of describing things as a seven year old would likely comprehend it. He imbues the world with a sense of magic, of innocence, but also of horror and helplessness. This is no children's book despite the age of the narrator. The most memorable characters of this tale are the Hempstocks - Lettie, her mum, and gran - and the evil Ursula Monkton. Lettie is a wise beyond her years (literally, she's beyond her years) 11 year old who takes the narrator under her wing. For all Lettie's wisdom, her mistakes help get the boy into quite a mess and it's a conundrum of whether he will get out of it. I loved Lettie, but I also loved Ursula, in a different way. She reminds me of Delores Umbridge. Pure evil couched in a sickly sweet manner. She charms everyone in the boy's family, turning them all against him, and makes the boy's life a living hell. To the point where the book became uncomfortable to read. A villain I will not soon forget. I listened to this book on audio. I think audio is the best way to go for Gaiman's books, especially when he reads them. I love his accent. His soft voice lulls you into the story and always does just the right inflections and emotions. 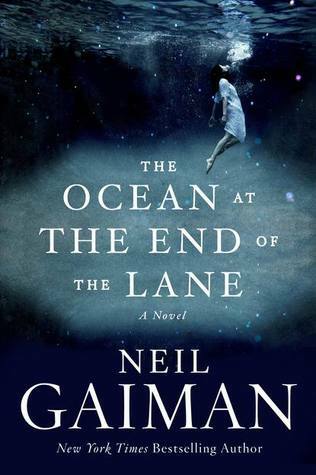 Of the three Gaiman books I've now read The Graveyard Book is still my favorite, but The Ocean at the End of the Lane is a wonderful book. It's one I could re-read multiples times and still get something out of it. We read The Ocean at the End of the Lane in my Science Fiction Book Club and it really sparked a discussion. This is the second Gaiman book for us and both have been a hit. Awesome! I don't think I ever read anything by this author. I really liked this one too. It does have a fairy tale feel to it, but I got more of an allegorical message about childhood and losing innocence. I have read a few books by Neil Gaiman and I really liked them too. I think I have a sample of this book on my Nook somewhere. If only I did not have a giant pile of library books to get too. I hope I am able to get to it soon.